Depeche Mode is all set to play live throughout North America this season in support of their latest album ‘Delta Machine’. The highly celebrated electronic band will be hitting the major concert venues in Asia, North America and Europe as a part of their Delta Machine Tour. Depeche Mode has already entertained millions around the world with their chart breaking albums and award winning singles. The English band has released thirteen studio albums, ten compilation albums and over fifty singles, garnering numerous awards and accolades over the years. The electronic sensation can be witnessed live by the fans this season by getting hands on Depeche Mode tickets . Formed in 1980, the band initially comprised of Alan Wilder, Vince Clarke, Andy Fletcher, Martin Gore and Dave Gahan. The band released its debut single ‘Dreaming of Me’ in 1981. The single was a moderate success and reached number fifty seven spot on the UK Singles chart as well as landed on the German Singles chart. Depeche Mode released their debut studio album ‘Speak And Spell’ during the same year. The album made it to the music charts around the world, peaking at number ten in the UK, number twenty-eight in Australia and number twenty-one in Sweden. With a five star rating from Record Mirror, the album garnered positive reviews. It was certified Gold in Germany and UK. The album also comprised silver certified hit single ‘Just Can’t Get Enough’ that peaked at number four in Australia and number eight in UK. Since then all the studio albums released by the band have reached gold or higher status in various countries. In 1993, the band’s eighth studio release ‘Songs of Faith and Devotion’ became a massive hit around the world. The album topped the charts in US, UK, Switzerland, Germany, France and Austria. With hit songs such as ‘In Your Room’, ‘Condemnation’, ‘Walking In My Shoes’ and ‘I Feel You’, the album sold millions of copies, reaching gold in UK, Switzerland, Germany France and Austria, whereas platinum or higher in US and Canada. After releasing two consecutive platinum selling albums, the band released ‘Playing the Angel’ in 2005. The album was again a chart topping hit worldwide, peaking at number one spot in the US, Switzerland, Sweden, Portugal, Poland, Norway, Italy, Hungary, Germany, France, Denmark, Netherland, Belgium and Austria. It reached gold in UK, Sweden, Portugal, Mexico, Canada, Austria and Argentina whereas as platinum in Spain, Russia, Poland, Hungary, Germany and France. Over the years, Depeche Mode has received numerous accolades and honors for the innovative work. The band has bagged twenty eight nominations including five Grammy Award nominations, four BRIT Award nominations and four MTV Europe Music Award nominations. They have also won a Q Magazine Award, an Echo Award, UK MVAs as well as a BRIT Award. With sales of over hundred million albums and singles worldwide, Depeche Mode has been ranked amongst the ‘100 Greatest Artists of All Time’ by VH1. They are also hailed as the ‘most popular electronic band the world has ever known’ by Q Magazine. Depeche Mode is highly praised for their electrifying live music concerts. Currently a trio consisting Andy Fletcher, Martin Gore and Dave Gahan, Depeche Mode continues to allure thousands of fans at their live acts every year. With the release of their latest chart topping, platinum certified album ‘Delta Machine’ the group will tour throughout the world, playing live in Birmingham, Las Vega, Los Angles, Santa Barbara, Dallas, Tampa, Atlanta, Brooklyn, Montreal, Toronto, Saint Paul, Berlin, Milan and London amongst other cities. The fans can make sure to catch the band live in action by buying Depeche Mode tickets for a memorable musical experience. After going on a hiatus for four years, Depeche Mode is ready to make a comeback with their new album titled, ‘Spirit’ which is expected to arrive in the markets on March 17th. The band is scheduled to perform 34 shows in Europe and 29 in North America. The five time Grammy nominated group will be starting their trek on May 5th and will be making stops in countries like, France, Greece, Denmark and Canada. The trio will be playing their last show of The Global Spirit Tour on November 4th at the Foro Sol. English electronic band Depeche Mode recently announced that they will be heading back to North America in 2018 to promote their new music record Spirit. After a South American and European run, the musicians will perform a show in Anaheim on May22. The trek stretches into June with performances in cities including San Antonio, Brooklyn, Philadelphia and Chicago. Spirit is the fourteenth studio album by Depeche Mode. It was released via Columbia Records in March of 2017. The lead single of the record, Where’s the Revolution was released on the 20th anniversary of their 1997 song Barrel of a Gun. English Synthpop band Depeche Mode is all set to hit the road this year to promote their upcoming music record ‘Spirit.’ Titled ‘Global Spirit Tour,’ the trek will begin its North American leg in Salt Lake City following a massive European run in spring. 28 dates have been announced for the North American tour. These include stops in main cities such as Los Angeles, New York, Las Vegas and Washington DC. Once the US shows are wrapped up, the musicians will be travelling to Canada for concerts in Toronto, Vancouver and Montreal. ‘Spirit’ is the fourteenth music album by Depeche Mode. It is slated to release on March 17, 2017. Nothing beats the joy of watching your favorite music artist perform live! Depeche Mode's concert dates are out and fans are looking forward to the upcoming shows. The next concert will be held in Los Angeles at the Echoplex At The Echo on 5-May-19. For complete information regarding dates and venues, please visit our website. Currently the average price for Depeche Mode tickets is $228. The date and location for this event is 5-May-19 at Echoplex At The Echo, Los Angeles. The minimum get-in price for Depeche Mode tickets is $18. Q:Before buying The Global Spirit Tour Tickets I want to look at the seating chart. Is it possible? A:Yes it is. Kindly click on the Depeche Mode Tickets button on our website and it will lead you straight to the seating map. You can also visit the official website of the venue where Depeche Mode is performing and look at the seating map. But before you pick out your desired seat please check with our sales representatives to see if it’s still available or not. Q:When will Depeche Mode Tickets 2018 be available for purchase? I want to attend the Toronto concert. A:Depeche Mode Tickets for all of their concerts are now available and you can easily purchase them from our site. Toronto concert will take place at the Air Canada Centre on September 3. The average price of tickets offered by our brokers at the moment is $246. The minimum get-in-price is $67. For more information you can also contact our customer representatives. Q:I want to buy Depeche Mode tour 2017 tickets for their Denver concert, are you selling them? A:We sure are. Depeche Mode will perform at the Pepsi Center in Denver on August 25 and Depeche Mode Tickets are available at the average price of $217 on our site. The minimum get-in-price is $55. For more information on their other concerts please go through our inventory. The band is touring in support of their 14th album "Spirit". Q:I heard that Depeche Mode Announce North American Leg of the Global Spirit Tour. What are the dates? A:Depeche Mode will kick off the North American leg on August 23 from the Salt Lake City and are slated to perform in big cities like Denver, Chicago and Washington. In New York they will rock the stage at the Madison Square Garden on two dates (September 9 & 11). The demand for Depeche Mode Tickets has increased especially since their album "Spirit" finally hit the shelves, featuring incredible songs. Q:Please tell me when do Depeche Mode tickets go on sale? A:Depeche Mode Tickets for their Global Spirit 2017 Tour are already on sale and selling out fast. The band took the fans by storm with their 14th album "Spirit", the lead single "Where's the Revolution" finding its way to the music charts. The North American trek starts August 23 and will wrap up on October 27. Q:How much are Depeche Mode tickets for, for their Global Spirit Tour? A:The British sensation Depeche Mode is out on their Global Spirit 2017 Tour and the Depeche Mode Tickets sales are already off the roof. The average starting price for the European shows is $107; whereas the average starting price for the US show is $197. The minimum get-in-price is $20. For more details please browse through our website and check for the updates. Q:What genre of music is depeche mode? A:Depeche Mode is a synth-rock band at its core but the trio featuring Andy Fletcher, Martin Gore and Dave Gahan experiments with various forms of rock. Having released 14 albums till now, the band incorporates new wave, alternative rock, dance rock and electronic rock into their music. Their latest album "Spirit" is also a blend of all these styles. Catch the band live on their Global Spirit 2017 tour by buying Depeche Mode Tickets. Q:Do you have the most recent depeche mode concert video? If yes can you please share it? A:Sorry, we don't have videos available on our website due to copyright issues and infringement. You can try video sharing websites as they usually have such content. But if you're looking for Depeche Mode Tickets then you have come to the right place. Tickets to their "Global Spirit 2017" tour are available at affordable rates for both the European and North American legs. Q:How to get tickets for Depeche Modes 2018 tour Tickets? A:Depeche Mode is out with their 14th album "Spirit" and the English band has announced a supporting "Global Spirit 2018" North American tour. 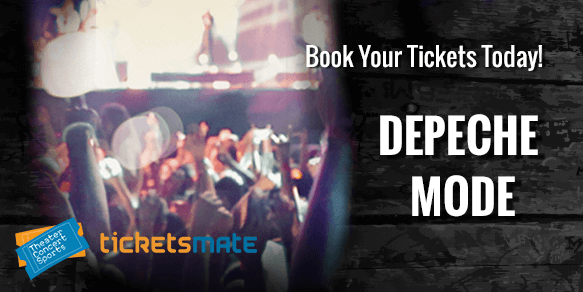 You can easily get the Depeche Mode Tickets from our brokers via our website. All you need to do is browse the inventory and select the date and event you want to attend. The single "Where's the Revolution" has already made it to the charts and earning incredible reviews from the fans. Q:Is there any chance cheap depeche mode london tickets prices will be reduced even further? A:No, Depeche Mode Tickets prices will remain as they are and will not be reduced any more in the future. Q:How much are the handling charges that i will have to pay on Depeche Mode Tickets? A:You can get your required details about the handling charges from the checkout page of Depeche Mode Tickets. Q:What benefits will I get if I buy cheap depeche mode tickets from you guys? A:For complete details about cheap Depeche Mode Tickets and the benefits you will get if you buy them from us, please log on to our website or call us on our toll free number in case you need any further assistance. Q:What if the courier company loses my depeche mode tickets 2018? A:That will not happen but just in case it does then we will provide you with new Depeche Mode Tickets without any extra charges. Q:Have the dates for depeche mode tour been finalized? A:Not only have the tour's dates been finalized but Depeche Mode Tickets are also now available for you to buy from us and that too at amazing prices. Log on to our website for details and book your tickets now. Q:When will I be charged for my depeche mode 2018 tour tickets? A:It will take us one day to charge you for your Depeche Mode Tickets. Q:When will I be charged for my depeche mode concert tour tickets if the next day is a holiday? A:In that case you will be charged for your Depeche Mode Tickets on the first working day after the holiday(s). Q:Is it safe to buy depeche mode tickets cheap online? A:Yes it is absolutely safe to buy Depeche Mode Tickets online from us as we offer hacker free facilities.